Please wait while page data are computed. ADoodle is a simple service for you to organize an anonymous survey or vote among your colleagues or friends. If you have already used Make a choice feature at Doodle.com then you may consider ADoodle.org as an Anonymous version. ADoodle.org is a free and secured service without any registration. Simply set up a vote with a list of choices and emails and let the participants express themselves freely and anonymously. 14 November 2018: The vote machine has been unavailable during 8 hours this Wednesday night 00:07-08:01 (UTC+01:00 Paris). The vote machine was unable to send emails. Everything is back to normal. ADoodle.org can only apologize for the troubles in the running votes during this period of time. 20 May 2018: The vote machine has been unexpectedly paused during 6 hours this Saturday night 04:08-10:21 and 10:55-11:00 (UTC+02:00 Paris) following a bank transfer problem to the internet service provider. The server has been unpaused, without loss of data. Everything is back to normal. Sorry for the inconvenience. 10 Fev 2018: Around 16:00-17:00 The service hosting ADoodle.org vote machine has experienced a network problem for around one hour. During this hour creating votes and voting have been impossible. Sorry for the inconvenience, independent of our will. See explanations there. 24 Dec 2016: 00:38 A significant update of ADoodle.org core has been carried out. Language and time zone managament have been added. Despite thorough tests have been performed, please report any anomalies. 11 May 2016: 18:15 A hardware disk error has occured on the vote machine for one file. One vote has been invalidated. The service has been unavailable for half an hour. The developper can only apologize for the inconvenience. Please contact the webmaster if you need more information. 21 Oct 2015: Beware! Today between 23:00 and 23:59 (local Paris) the service will be unavailable. See the technical reasons here. 11 Jun 2015: 13:00-13:30 (local Paris) ADoodle.org server experienced a major crash. 5 ongoing surveys were invalidated due to damages to the vote files. The developper can only apologize for the inconvenience. The problem has been solved. The relevant participants are informed when connecting. 07 Oct 2014: ADoodle.org has been unavailable for 14 hours due to an equipement incident on the service provider infrastructure (technical information here). All our apologies about that, please contact the support in case of subsequent difficulties. The equipement has been replaced. 25 Sept 2014: After 'HeartBleed', 'Shellshock' is the new world wide super-bug reported on by Stéphane Chazelas. Bash is updated. 11 Apr 2014: ADoodle.org is unaffected by the recently identified worldwide so-called "OpenSSL Heartbleed Bug". Verify that here, here, here, and here. It is a good practice to have a look - first - at the recommendations to vote creators in the Help tab. At any time the language and time zone of the interface and of the sent emails can be chosen on the left. The emails always contain an English version. Please use only the buttons on this web page, not the Back and Forward buttons of your browser, which functions have been altered for security reasons. This will be the subject of the sent emails. For the information to the participants. The voters will select an answer corresponding to this question. The voter can only choose one of the proposed choices. Please give a list of emails (one for each line or in comma separated form or else). The voter will receive an email containing a unique personal vote ticket and two links to vote and to display the results of the vote. Naturally a voter can only vote once. All the emails are erased from the vote machine memory after use. NB: Check carefully the emails. All emails must exist and be valid and must not block emails from ADoodle.org. An excellent practice, with this list, is for you to send an announcement email to the participants (using your own email account), before creating this vote. It will help you detect defective addresses. See 'Help' tab about vote creators. You may define weights for the voters by indicating a weight after each email address. Do not worry about the format, simply put a weight number (integer or floating point value) after the email. The weights will be extracted whether they are alone or in parenthesis or brackets or else. it means that there are three voters with vote weights of 2, 1.5 and 1 respectively. In this case the total weight is 2+1.5+1 = 4.5. Anonymity considerations. If you choose to define weighted voters, the full anonymous character of the vote cannot be strictly guaranteed. See Help tab. In pratice, to increase anonymity, try to maximize the number of identical weights among the voters and to maximize integer ratio between the weights (e.g. weights such as 1, 2 and 3 or 0.25, 0.5, 0.75 etc). Please give a list of emails.The observers will receive an email containing a link to display the results of the survey. An observer does not vote. All the emails are erased from the vote machine memory after use. If you create the vote and do not vote, then put your email here to follow the results. NB: All emails must exist and be valid and must not block emails from ADoodle.org. See 'Help' tab about vote creators. No dates are defined. Voting and observing the results will be possible at all times. Please review carrefully the other parameters of your vote. A check mark means that the option is active, otherwise the option will not be applied. Since no date limits are specified, the participation rates will be available at all times. Idem, the results will be available at all times. By clicking on the following Previsualize button, the input data will be checked and the vote data will be previsualized. To vote you will receive an email with the proper link. To see the results of a vote you will receive an email with the proper link. Here is a demonstration of the vote creation steps. The first step is defining the parameters of the survey/vote. Do not worry, if you forget something ADoodle.org will tell you what is needed when you go to the previsualization step. Your main effort should be the email list, whatever its format. It is your responsibility, considering the participants, to provide a list of valid emails. Otherwise some participants may not receive the vote email. A good practice is first to invite the participants to a test survey. The previsualization step checks that the vote parameters are correct. This step also helps you previsualize and check what kind of email will be received by the participants. You can go back at any moment by pressing the "Previous step" button at the bottom of the page. Do not use the back button of your browser because the memory cache of the browser is deactivated for security reasons. You may now confirm the vote creation. Once you press OK you cannot go back. The vote will be created and available at all times to the participants only. Note that a vote cannot be deleted. After the emails have been sent, you can see a confirmation that all the emails have been correctly emitted. It is important at this moment to close the page or your browser. If you happen to reload this page somehow, then a second identical vote will be created. You do not want that. Once you have voted, the page confirms your vote and propose you to go to the result page. Here is typically what you will see when clicking on the observer link, to observe the results of the survey/vote. Note that a textual (detailed) description is given for a clear analysis of the results. CHECK carefully your email lists. WARN the participants that they should expect an email from no_reply@adoodle.org. Suggest to check the spam folder. Emails from ADoodle.org are not spam. Consider creating a TEST vote before the "real" one. Note that some other useful options are available like adding date limits, or defining weighted votes if really necessary. Have a good anonymous vote. Here are Frequently Asked Questions (FAQ). The definitions of the terms voter, observer, creator etc. are in the 'Help' tab. 2. What are the founding principles? 4. How do I know that the vote is anonymous? 6. What information is shared among the participants? 8. What is not stored? 15. What does ADoodle mean? 16. How do I contact the author of ADoodle.org? 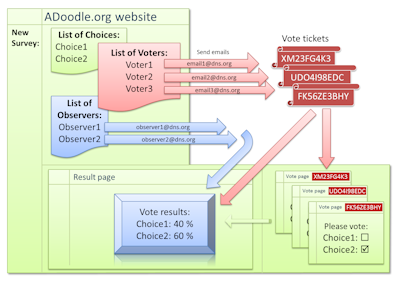 ADoodle.org is a website to organize, in a very simple way, an anonymous survey or vote. ADoodle.org is based on fairness, transparency, equality, full symmetry between the voters and the anonymous character of the cast vote. - The cast vote is anonymous, not the list of potential voters and observers. - The vote is even doubly anonymous. No one knows who has voted. * No one knows what a voter has voted. * The reason is that the vote machine only recognizes random personal vote tickets. - Also internally, the vote machine does not know who has voted. * The reason is that the temporary relation between the personal vote ticket and the email is erased at the first connection of the voter, before the voter has even voted or not. * Concerning anonymity please keep in mind 2 very general facts that are not specific to ADoodle.org. 1) Your active participation anonymity is lost if all the voters vote (in this case all the participant will know that you have voted) or if no one votes (all the participants will know that you have not voted). 2) Your vote anonymity is also lost if all the voters vote and vote for the same choice. - Each voter receives an email with a personal vote ticket. The personal vote ticket is a random number that does not contain any information on the email. - The server itself erases the relation between the email and the personal vote ticket as soon as a voter connexion occurs after a vote has started. The email lists are also completely erased after the end of the vote. - With this procedure one can vote anonymously, from the vote creator side, from the other participant sides, even from the vote machine side. - There is no public information about a created survey. Only the voters and the observers receive information about the vote they belong to. So the question is actually: what information is available within the participant group? - All the participants share the same information about a created survey: voter and observer lists, title, question, choices, dates etc. - The vote creator does not have more or less information than any other participants. S/He is simply the person who creates the survey. The vote creator does not have special powers. - Since the email list of voters is received by all the participants, each involved participant can control the conformity of the list with what has been announced by or agreed with the vote creator. - The list of observers is also transmitted to all the participants. The observers are the group of people who do not vote but get the link to the result page as well. - The voting tickets (random numbers) are stored on permanent files. - Emails addresses are only temporarily and partially stored, elsewhere, until the end of the vote or the first connection of the voter. The relation between the personal vote ticket and the voter is erased as soon as possible, at the first connection to the website, before any vote operation from the voter. All emails whatsoever are completely deleted after the vote end. - An observer typical email, such as the one sent to the observer(s), is sent to the webmaster for statistical purposes and minimum support, as well as with connections to the website. - As soon as a voter connects to the website the email relation with the random ticket is first erased. After the end of the vote, all the remaining email lists whatsoever are deleted from the vote files. As a result the email list ends to be only available in the sent emails and known from the addressees, and not stored on the server. - One could argue that the list of emails may be kept stored in some uncontrolled system disk or memory cache or system log file but 1) this is out of any user reach anyway 2) in any case the relation between the emails and the personal vote tickets is deleted. - Personal vote tickets are created randomly from a seed provided by date and time measured down the microsecond when the creator creates the vote. Sophisticated pseudo-random generator is used, cryptographically graded. It is therefore virtually impossible to predict the value of this key and the values of the unique tickets sent to the voters. The machine has no knowledge of relation between a voter email and a personal vote ticket when the vote occurs. The machine no longer knows what are the email origin of the vote anonymous tickets. - The personal vote ticket is basically a unique large binary random number like 2c9586f8ac66be373ef6e5041e965224 in hexadecimal format. This number is chosen so that it cannot be easily guessed by anyone, even a computer (see strength limits and security considerations below). - Beware: if one person appears in the created voter list twice with two different emails, then this unique physical person will be allowed to vote twice. To counterstrike that, the email list is transmitted to every participant with their voting tickets. So everyone can check that the list is ok. The person creating the vote must take care to provide only one email for each participating real person. Note that the vote machine checks email lists for obvious duplications and wrong email addresses but only in their Domain Name Server after the @ sign. The web site uses strong cryptographic secured connexions (SSL certificates and https://... links) ensuring the condifential transmission of your vote from your internet browser to the vote machine. How strong is the anonymous character of the my cast vote? When you cast your vote, it goes through an encrypted secured channel (technically https://...) and no-one in between can see what your vote is. Since the vote machine has no knowledge of the voter identity at vote time and after, and only counts cast votes, your cast choice and choice related identity are rather well protected. How strong is the anonymous character of my participation to a vote? Your participation now is as anonymously strong as the security on email traffic is. If someone gets access to your email, s/he could see that your are involved in a specific survey. Using your personal vote ticket, s/he could see either that you have voted or that you have not voted (but s/he could not tell what you have voted). Or s/he could vote instead of you using your vote random ticket. In this case if you try to vote after the "spy" did, you will not be permitted to do so and therefore you will realize that something has gone wrong. Your internet browser may keep some vote or result links in its browsing history. However these links do not contain any identity information. One can vote only once. In the vote machine, the relation with the email is deleted at first connection after the vote start date and all the emails and remaining relations deleted after the end date. So if you think that reasonably no one will look at your emails, then your can participate with good trust. When should I not use the vote mechanism provided by ADoodle.org? If you think that someone may listen to your email (unsecured) traffic, such as a computer-skilled colleague or the computer administrator of your network, AND may be ill-intentioned then you should not use this website. If you think some unwanted person is liable to observe your email traffic, do not use this vote mechanism. This person could vote instead of you. If you do not trust the webmaster (see contact at the end), do not use this website. This website has been made so that small more or less formal organisations (such as a group of well-intentioned co-workers, scientists in the case of the webmaster, or friends) can organise quickly a convenient electronic vote. The website gives vote action anonymity (not voter email address anonymity!) to probe voters' overall opinions without going through an "every-one-knows" or "I know nothing" doodle procedure. The vote mechanism is both simple and anonymous. Your vote will always be cast anonymously. If you think that reasonably no one will look at your emails, then your can participate with good trust. - The vote creator is informed of the success of the vote creation and of each email emission. This is controlled by the vote creation mechanism. - If a technical problem occurs during email emission (e.g. overload), the vote is immediately invalidated. No one will be able to vote. The participant will be informed, directly on the result page, that the vote is not available. - If a participant does not receive the email, it can be re-sent only if the personal vote ticket has never been used to connect to vote machine and only before the end of the vote. - Email emission is tested for success (or failure). Email transmission is based on the robustness of email communications through the internet (which is pretty good). 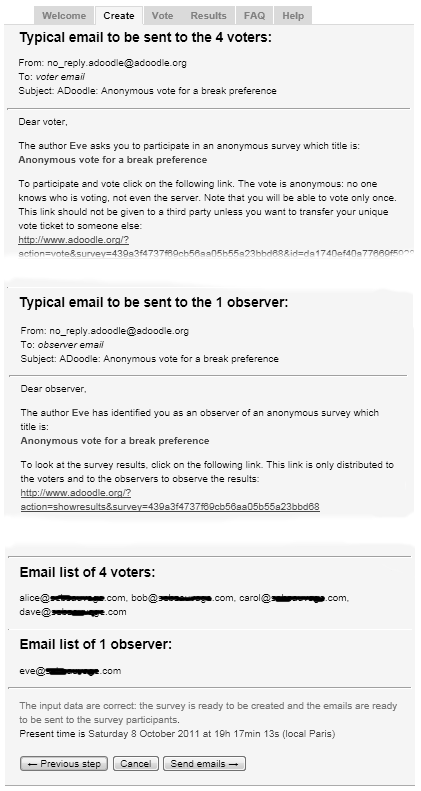 However if a participant is behind a server/firewall that purposely blocks ADoodle.org emails, the participant will not see that a vote has been created. Because the distant email servers do not always tell that they block emails or not, there is no definite way of knowing that the email did not arrive at destination. Even if they do tell, ADoodle.org does not detect bounce emails. It is therefore a good practice, for the vote creator, to test and to inform the participants that they should expect an email from: no_reply@adoodle.org and that they should react if they do not receive it. The participant can have the email resent in the Help tab. These emails are not spam. - See "Security considerations" question for attack scenarii. 30 Oct 2010 α version Test of the skeleton vote mechanism. 15 Nov 2010 β test Doodle like interface is added. 8 Dec 2010 Version 1.0 The official first version is released. 1 Jul 2011 Version 1.1 SDoodle functionalities are incorporated into the PHP code. 5 Sep 2011 Version 2 Date management is added. Participation rates are made available during the survey. 25 Sep 2011 Version 2.1 Weighted votes are implemented. 8 Oct 2011 Version 2.2 A "Demo" tab describing the survey/vote steps is added. A menu is added to the FAQ tab. 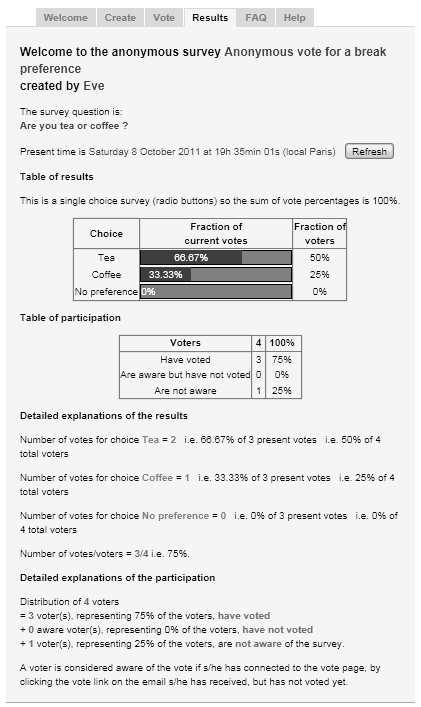 25 Oct 2011 Version 2.3 In multiple choice survey/vote (made of check boxes), the vote creator can now select a required minimum and maximum number of choices for the voter. The table of choices is added to the result page for reference. 31 Oct 2011 Version 2.3.1 A temporary misspelling in the HTML code of the vote page, originating from version 2.3, has been corrected. Depending on the browser, this misspelling prevented the reading of the radio button vote choices. All other surveys were unaffacted. We can only apologize for the inconvenience during 25-31 Oct 2011 period of time. 19 Nov 2011 Version 2.3.2 Minor changes in the peripheral code. 28 Jan 2012 Version 2.3.3 Minor changes in the peripheral code. 19 Mar 2012 Version 2.3.4 A test email from can be sent before creating the vote. The vote identifier is now displayed on the vote and result pages. 23 Mar 2012 Version 2.3.5 This is an unreleased beta version. The released version is unmodified. 27 April 2012 Version 2.3.6 Migration from PHP 5.2.3 to PHP 5.3.2. Some down times due to the server update have been observed, sorry for the inconvenience. 21 Oct 2012 Version 2.3.7 The vote identifier is explicitely given at the end of the sent emails with information on manual construction of the observer link. Idem for the personal vote ticket number in the vote emails. 31 Jan 2013 Version 2.3.8 An external date conversion tool (timeanddate.com) is provided as a link when date/time limits are given. Elapsed time or time-to-wait are now indicated on the vote and survey pages. 21 June 2013 Version 2.3.9 Better handling of user ancient ultramalformed links. Use of collapsible panels during survey review step. 17 July 2013 Version 2.3.10 It is no longer possible to simply duplicate a survey for test purposes. The user must now create a new survey each time. 14 Dec 2013 Version 2.3.11 Weight extraction code has been corrected following an incorrect parsing of weighted email lists discovered by J.S., Denmark (Thank you). The problem was occuring only some specific email address lists i. containing similar emails and ii. reversed alphabetical order and iii. numbers in the emails. 30 Mar 2014 Version 2.4 Connexions are now all secured with strong cryptographic SSL certificates (meaning https://... links on the father https://www.adoodle.org web site). The documentation is altered accordingly. Server RAM memory is doubled to due recent occurences of overloads. 11 Apr 2014 Version 2.4.1 Anyone can check here, here, here, and here that the SSL certificate and implementation of ADoodle.org is not affected by the recently identified worldwide so-called "OpenSSL Heartbleed Bug". 22 May 2015 Version 2.4.2 Specific instructions are given to add ADoodle.org as an accepted domain in the spam filter. For instance in Hotmail menu Settings/Options/Safe and blocked senders/Safe senders/type, enter 'adoodle.org' then click 'Add to List'. 18 Jun 2016 Version 2.5 Vote identifier and ticket number input fields are added to the vote and result tabs. In case a vote/result link is malformed (when clicking in the email), these numbers can be input directly on the web site. Instructions on how to proceed are provided at the end of the sent emails. 29 Jun 2016 Version 2.6 Significant evolution of the vote machine code. The email list is now temporarily stored to provide better assistance (email resending) but the emails-vote_ticket relation is erased at first connection during a survey, before any vote action, and all remaining emails are systematically erased after the end of the vote. Email and vote page and result page translation in French for some users (not yet publically accessible). 3 Aug 2016 Version 2.6.1 Following the suggestion by user Joe Zidell, a link is now provided at the end of the previsualization step to recall all the survey form data in the create tab. Bookmarking this link should help create successive surveys based on the same base data. 24 Dec 2016 Version 2.7 Time zone management. Complete French translation. Update of the SPHP framework. Replacement of the survey concept with the vote concept. Improvement of the multiple choices test board. 22 Jun 2017 Version 2.7.1 The cache system prevented the time zone management to update to daylight savings twice a year. The bug, discovered by Jeff Meys (thank you! ), is now corrected. 20 Feb 2018 Version 2.7.2 Change of vocabulary: the clearer anonymous expressions "attentive voters" (who has connected without voting) and "inattentive voters" (who has never connected) replace the initial expressions "aware voters" and 'unaware voters'. Note: Small cosmetic changes do not increase version number. In a future version, ADoodle.org will implement a mechanism to detect bounce or incorrect or unresponsive email addresses. Also compliance with accessibility (see e.g. http://wave.webaim.org) will be improved. ADoodle is simply the "Doodle" word with a first capital letter meaning Anonymous. ADoodle.org lets you set up a vote or poll or survey which is anonymous for the participants. doodle.com is a famous website used to organize meetings or to make a choice. In the latter case, the participants must expose their choice to everybody else or let one person control the result page. ADoodle.org let you organize an anonymous vote among your colleagues or friends with maximum transparency, full symmetry between the participants, and reasonable anonymity in the vote and participation in the vote. Questions, opinions, suggestions, criticisms or encouragements are much welcomed. The webmaster can be contacted at adoodle[at]sebsauvage.com. Please replace [at] by the @ character. My job is scientific researcher in Physics in a laboratory which requires some anonymous probing of opinions. Hence this website. If you do not find answers to your problem here, please contact the assistance: email at the bottom of the page. The best way to understand how ADoodle.org works is to see it in action. For a start try to create a vote using your own email address in the voter list, or possibly several of your own addresses. I have not received the email. What can I do? Please first have a look in your spam folder and at the recommendations to the participants below. If you have not received the voter/observer email, or if you have lost it, or deleted it, please below ask the vote machine to attempt to re-send it. Re-sending is possible as long as the email has not be used to connect to the vote page and as long as the vote has not ended and only for surveys created after 1st July 2016. NB: Whatever the entered email, this process will not disclose any information. An information summary email is always sent when clicking 'Re-send'. I do not remember if I have already voted or not. How can I check that? In the received email, click on the vote link to connect to the vote page. The vote machine will tell you if your personal vote ticket has already been used to vote or not. There is no way to correct the email list after emails have been sent. ADoodle.org does not detect bounce emails. Warn the participants that they should expect an email from no_reply@adoodle.org. - Add ADoodle.org as an accepted domain in the spam filters, before creating the survey. - Suggest to check the spam folder. Emails from ADoodle.org are not spam. ADoodle.org cannot control the spam policy of the participants. Warning the participants will help you check that all email addresses are correct. Consider creating first a test vote before the "real" one. If a participant server blocks ADoodle.org emails on purpose, ADoodle.org cannot do anything about it. ADoodle.org cares about email emission but cannot check email reception (the emails end up to be deleted on the ADoodle.org server). If you do not receive ADoodle.org emails, configure and look into your spam folder. Configure your spamfilter not to catch ADoodle.org emails. Emails will come from no_reply@adoodle.org. If you do not receive ADoodle.org emails, check your spam folders in your email application and at your email server. When not properly configured, it may happen that spamfilters wrongly flag ADoodle.org emails as spam. Look for the email there. If your emails are forwarded by your email-account, check that forwarding does not block e-mails from ADoodle.org. Please note that re-sending an email is possible (see the top this tab) as long as the email has not be used to connect to the vote page and as long as the vote has not ended. In case of any difficulty or questions, please contact the support at contact[at]adoodle.org (replace [at] by the @ sign). You may also contact the developper at the address indicated at the end of the FAQ tab. - Someone, called the creator, creates the survey by providing a title, his name (or pseudo), a question (or subject) and a list of possible choices. S/He also provides a list of voters and possibly a list of observers(who do not vote). All these people are referred to as the participants. - All the participants share exactly the same information. ADoodle.org is based on fairness and equality. Everyone involved in the vote knows who are all the voter emails, who are the non-voting observer emails and can see the results of the survey. The vote creator - if s/he has included her/his email address in the list of voters or observers - does not know more or less than any other person involved in the survey. - When creating the vote, a vote email is sent to each voter to vote and look at the results. An email is sent to each observer to look at the results, but not to vote (see figure). - With the vote email to the voters comes two links. The first link enables to vote and should be kept secret, unless one wants to transfer its voting ability to someone else. The second link corresponds to the page of results. A priori it should not be distributed, unless the participant wants to expose the results to some other people, possibly once the vote period has ended. - One voter (i.e. one email address) can vote only once. - The vote machine has no knowledge of the physical identity of the voters. In particular the server, at voting time, has no knowledge of the email address of the voter. - The vote machine keeps track of the number of voters, number of voters aware of the vote and counts the various vote choices. A voter is said to be aware of the vote if s/he has connected to the vote page, by clicking on the link received by email, but did not vote. - The vote mechanism is the same for all voters. Note however that each voter can vote only once and can no longer vote after having voted. The voter can have knowledge of the results of the vote during the vote, if allowed by the vote creator, and at any time after the vote period of time. - A voter can transfer his voting ability to any other person by transmitting the email s/he has received for the survey. - The vote creator does not have special "powers" except the initial one to create a survey. - First, in an usual vote one can say that the weight of each vote or voters is 1, because 1 person equals 1 vote. The total weight of the votes is the number of voters (or total number of votes depending on how the results are presented). - In a vote with weighted votes, the vote creator gives an arbitrary weight to the vote of each voter (e.g. 2 or 0.1 or 10 etc). The results are constructed from the relative weight of each choice with respect to the total vote weight. - Weighted votes are an easy way to probe the opinion of represented groups of people. Each group proposes one representative voter. You want each voter to have a weight corresponding to his/her group size. In this case weighted votes is a straightforward solution to get accurate representativity. - Weighted votes may be useful in some cases such as in "Grands Électeurs" systems, but should be regarded as bad practice here because full anonymity cannot be guaranteed. - If you choose to define weighted voters, beware the anonymous character of the vote may not be guaranteed. For instance if all the voters have a weight of 1 except one voter who has a weight of one million, it is obvious in this extreme case to see if the latter voter has voted and what he has voted. In practice anonymity can be good without being strict as in a non-weighted vote. Note that the participants will be informed of the weights of all the voters. In the case of a weighted vote, the participants will be informed that the anonymity cannot be guaranteed. - If you set up weighted voters, try to maximize the number of identical weights and to maximize integer ratios between the weights. That will increase anonymity.